Footage shows that what had been presented in media as a 'settler attack' was, in fact, an act of defense against Arab attackers in Samaria. Tzvi Sukkot, Chairman of the ring-wing Otzma Yehudit organization, was an eyewitness to an occurrence this afternoon during which residents of the community of Yitzhar in Samaria entered the Arab village of Burin. While Israeli media had initially reported that some 40 “masked settlers” had entered the village and “started throwing stones” without providing further context, local Jewish residents confirmed that the incident came after dozens of Arabs threw stones at Jewish cars passing along the road near the village, forcing some of the cars to a halt and leading the drivers to confront the attackers in self-defense. 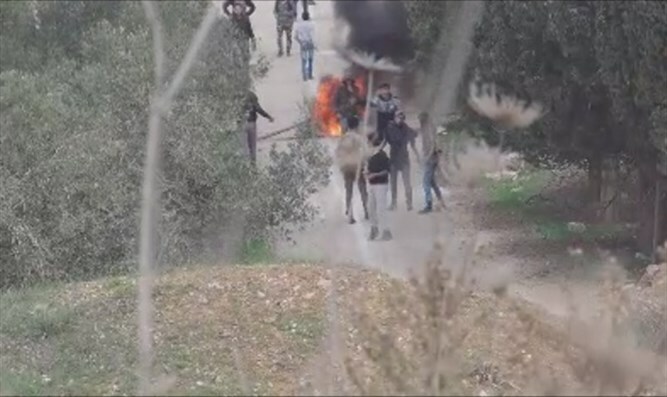 At a certain point, residents of Yitzhar arrived at the scene to provide assistance and pushed back at the Arab attackers, forcing them back to the village. In Sukkot’s footage, Arab youth from the village can be seen rioting and throwing stones at Jews. "The footage that the media received from Rabbis for Human Rights is spliced and edited, and it’s strange how Zechariah Sadeh, one of the leaders of the organization, always seems to show up ‘by chance’ to incidents during which stones are hurled at Jews in attempts to harm them."